Team Canada found a silver lining at the 2015 Winter Universiade on Friday morning in Granada, Spain. 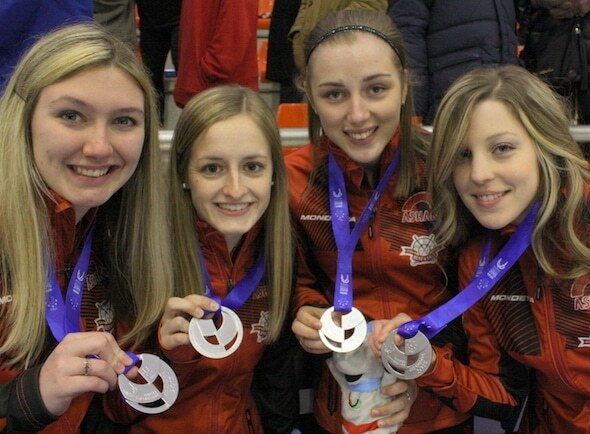 Team Canada, 2015 Universiade silver-medallists, from left, third Lauren Horton, second Lynn Kreviazuk, lead Jessica Armstrong, skip Breanne Meakin. Breanne Meakin’s Canadian women’s curling team — third Lauren Horton, second Lynn Kreviazuk, lead Jessica Armstrong and coach Doug Kreviazuk — were in tough in the gold-medal game at the Fuentenueva Pavilion on the campus of the University of Granada against an experienced Russian team skip skipped by Ford World Curling Championship bronze-medallist Anna Sidorova. But the Canadians managed to push the defending Universiade champion Russians all the way to an extra end before eventually bowing 9-8 when Sidorova made a takeout for the victory. The Canadian team was making its Universiade debut (although Meakin was an alternate in 2013) while two members of the Russian squad, third Margarita Fomina and lead Ekaterina Galena, was playing in their fifth Universiades, having won four previous medals. It was Sidorova’s third Universiade, and the same team was on the ice representing the host country at the the Ice Cube Curling Center in Sochi, Russia, during the 2014 Winter Olympics. That unrivalled experience made a difference in Friday’s gold-medal game as the Russians were able to come back from an early 6-2 deficit. Russia, 7-2 in the round robin, opened the game with a steal of one against Canada, which went 9-0 before beating Switzerland in the semifinal on Thursday. But the Canadians — Meakin attends the University of Manitoba while her teammates are Carleton Ravens — bounced back with a deuce in the second end and would steal three in the third for a 5-1 lead. The teams traded singles to go into the fifth-end break with Canada enjoying a 6-2 lead. Sidorova, though, was able to hit for a three of her own in the sixth to cut the lead to a single, and got a break in the seventh when Meakin couldn’t roll out her shooter in the seventh and settled for a single. Sidorova drew for a game-tying deuce in the eighth and then stole a crushing point in the ninth. Meakin drew for one in the 10th to force extras, where Sidorova was able to make her final shot for a second straight Universiade gold medal. 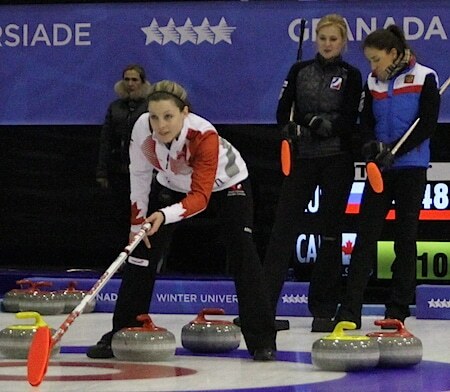 It was Canada’s fourth medal in Universiade women’s curling play, and third silver. Brittany Gregor captured gold in 2007 at Turin Italy, while Krista Scharf in 2003 (Tarvisio, Italy) and Hollie Nicol in 2009 (Harbin, China) both captured silver. The 2017 Winter Universiade will take place in Almaty, Kazakhstan.